The idea for this image clearly has its origins in China Mielville’s steampunk masterpiece, Perdido Street Station. In my imagining, an urban density of neon-lit blocks and dwellings, surmounted by a tall temple’s spire, has risen beneath the gigantic fossilised skeleton of an ancient beast. So this image does not truly depict Mielville’s vast diverse metropolis, New Crobuzon. where the Ribs jut over Bonetown, a makeshift market of temporary stalls, with scanty brick buildings and abandoned lots edging dirty scrubland. Tools break and cement remains fluid. A baleful influence from the gigantic half-exhumed bones limits development on the gravesite. 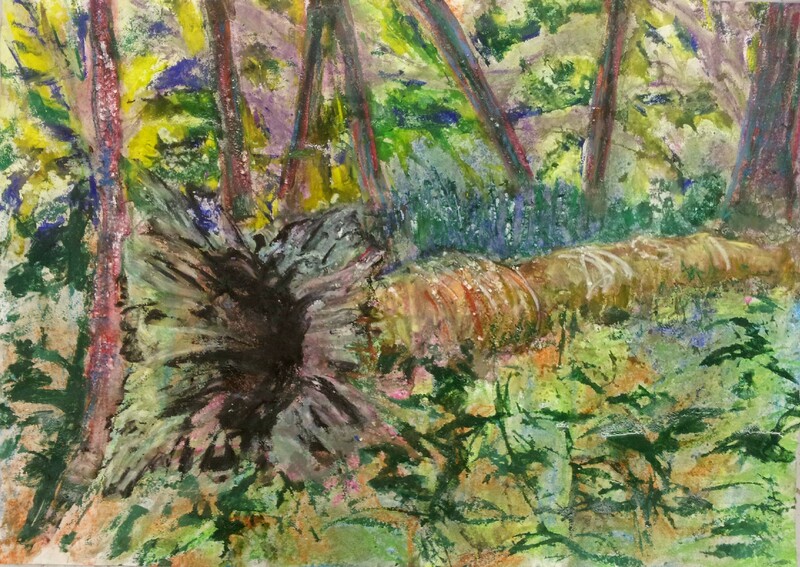 This piece started as an A1 size memory of the fallen tree in backlit woodland, drawn in chalk pastel, washed and blotted. 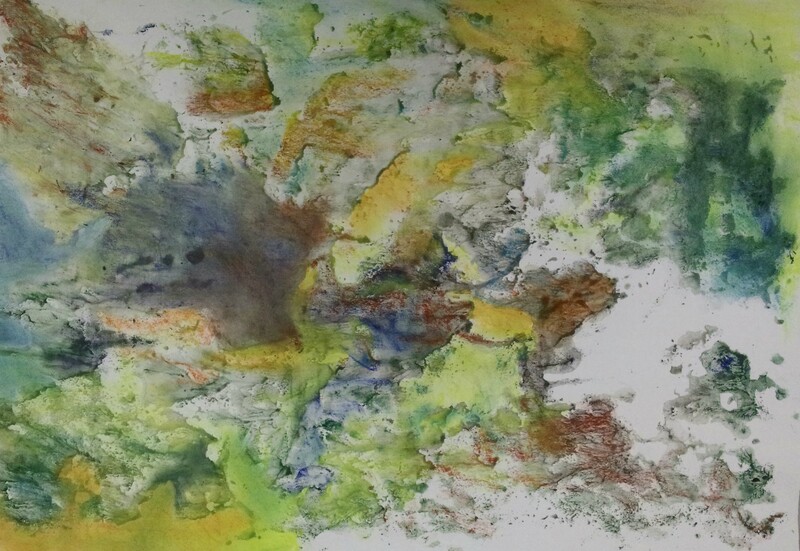 Seeking to further disintegrate it, it was wetted and covered in inks and white gouache. Weeks later, I drew the Ribs into the dried-dark image in oil pastel and painted onto this resist with diluted white acrylic. This still exists in that form, awaiting further work. I took a digital image and explored future directions of travel on the iPad in ArtRage. 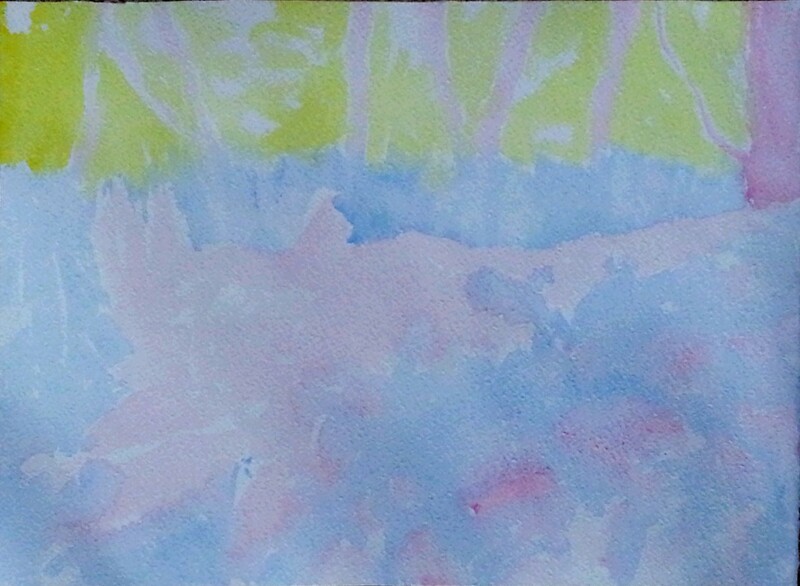 This is the finished painting built upon the previously-posted under-painting in rose madder, cobalt blue and aurolean. With this, I may have exorcised this image from my mind. In the experimental drawing workshop, the instruction was “cover a big sheet with chalk pastel”. 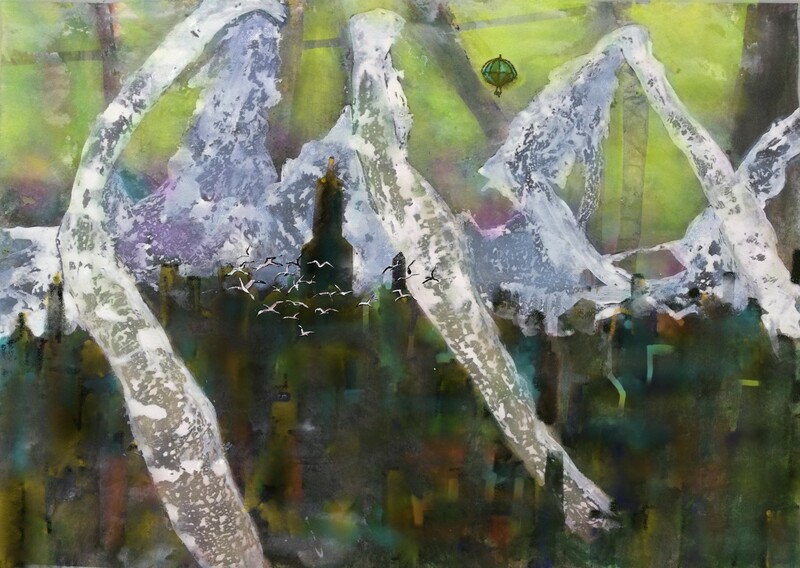 To build layers, drawing, smearing, wetting, fixing, drawing again. Others made patterns and abstracts. 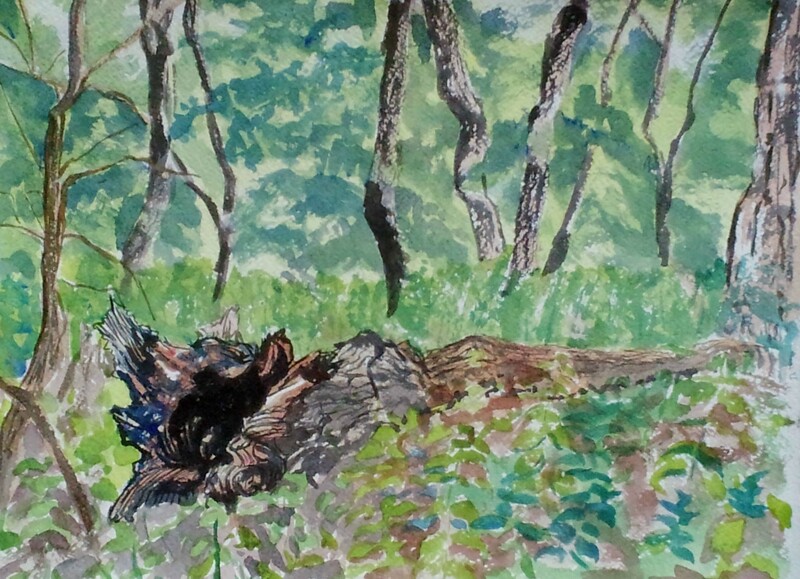 I still had in my head the image of the fallen tree set against the backlit foliage. 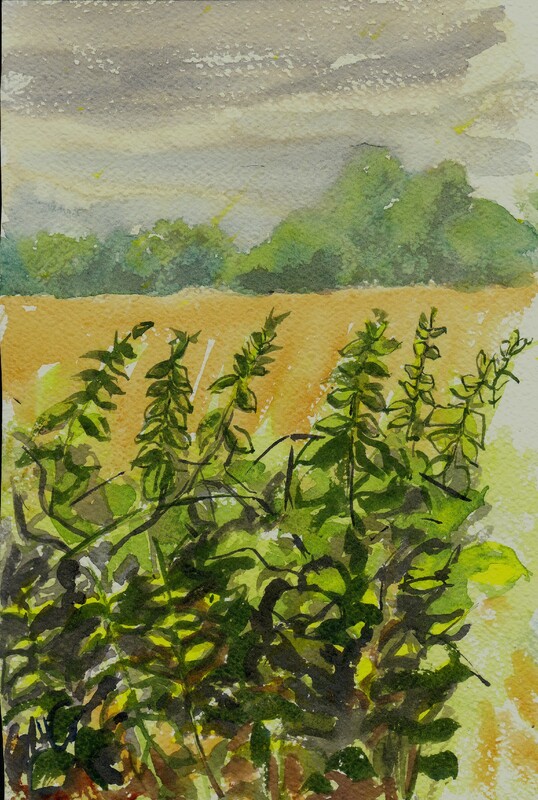 I did not particularly wish to create a recognisable landscape piece but it was a start. I reached a point where I wanted to disintegrate the picture I had started. I ran it under the tap, placed more paper on top and walked on it. Actually, the underlying image was rather resilient. The print was interesting though. At home, I rebuilt the picture from scratch, in just three colours, cobalt blue, rose and aurolean. These sketches are from late September. 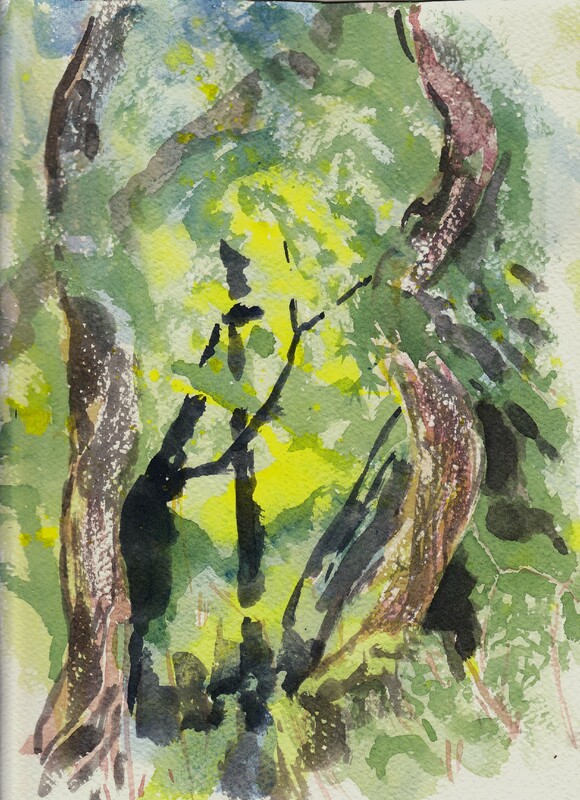 I went to Siden HIll Wood, still obsessed by light filtering through foliage. At the top of the ridge was a fallen tree, half hidden in the ground plants. The ground dropped of behind so I was looking into the canopy of the trees on the far descending slope. 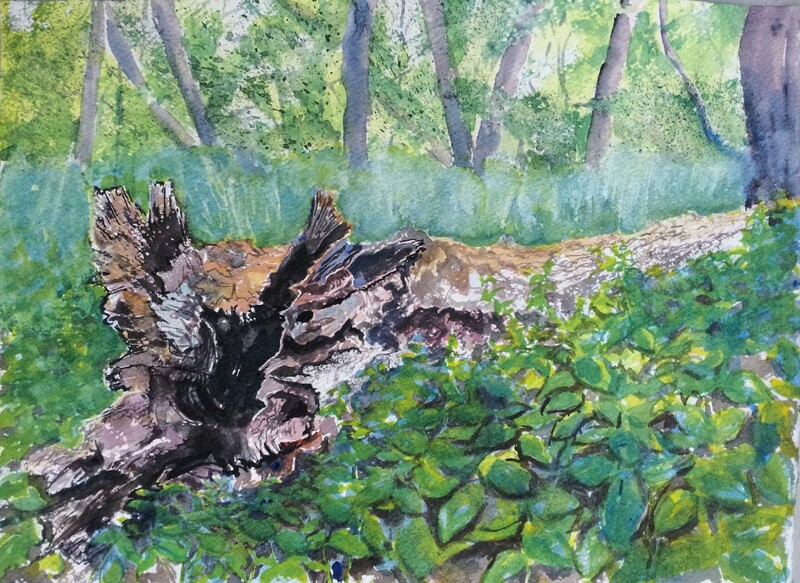 In these sketches, I struggled to give shape and texture to the torn and decaying wood. 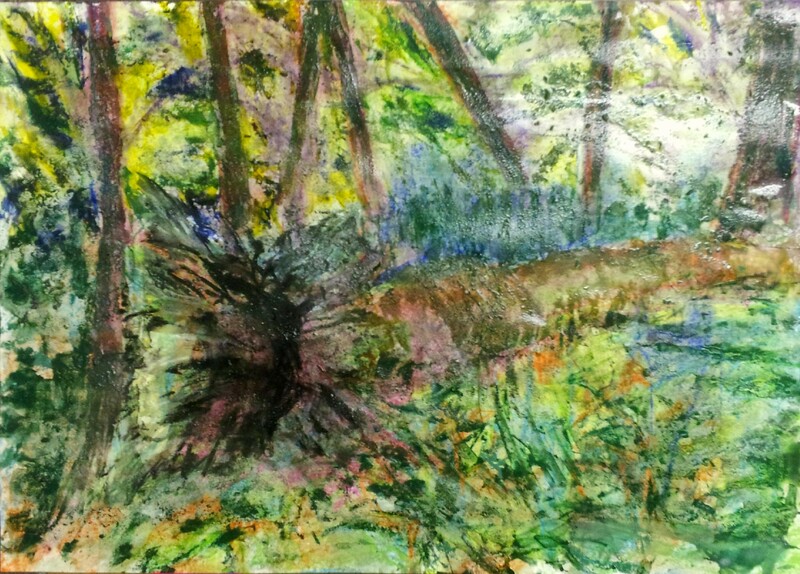 The last image was painted by the side of the path looking out across the undergrowth to the fields beyond. The fun part of this was drawing with a six inch nail. 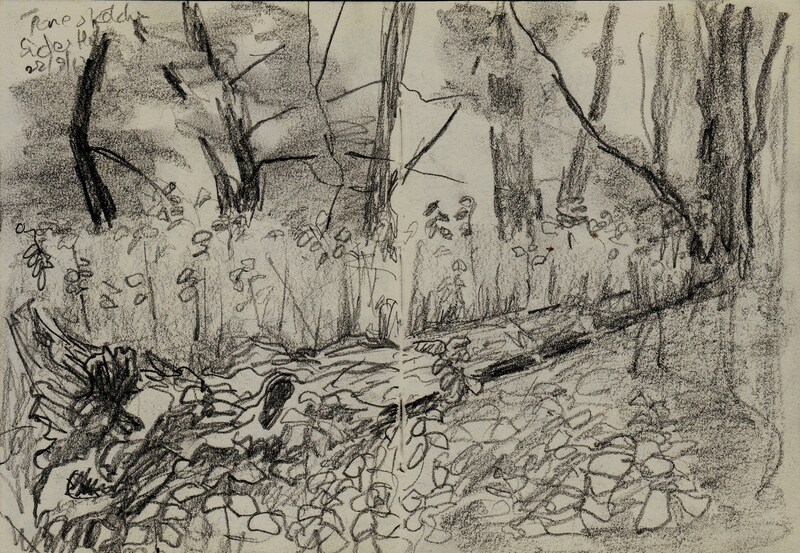 I simply traced over my earlier field sketch, working into a perspex block. 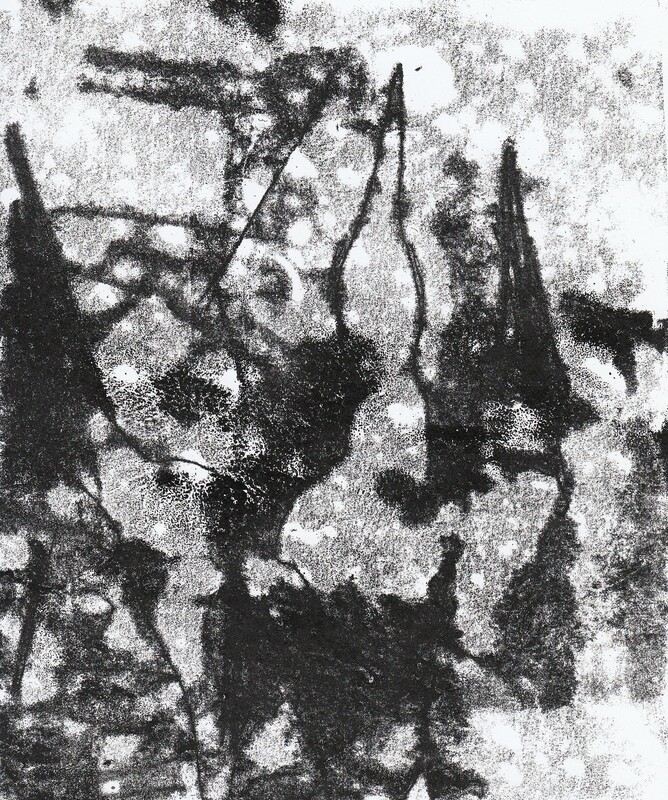 When printing, I smudged some ink back onto the plate, using elements of monotype to build some shadowing. If I wanted, perhaps I could tint this with watercolour or ink. At its simplest, this is perhaps a way or recycling the contents of my notebooks into finished pieces. If I can be bothered. 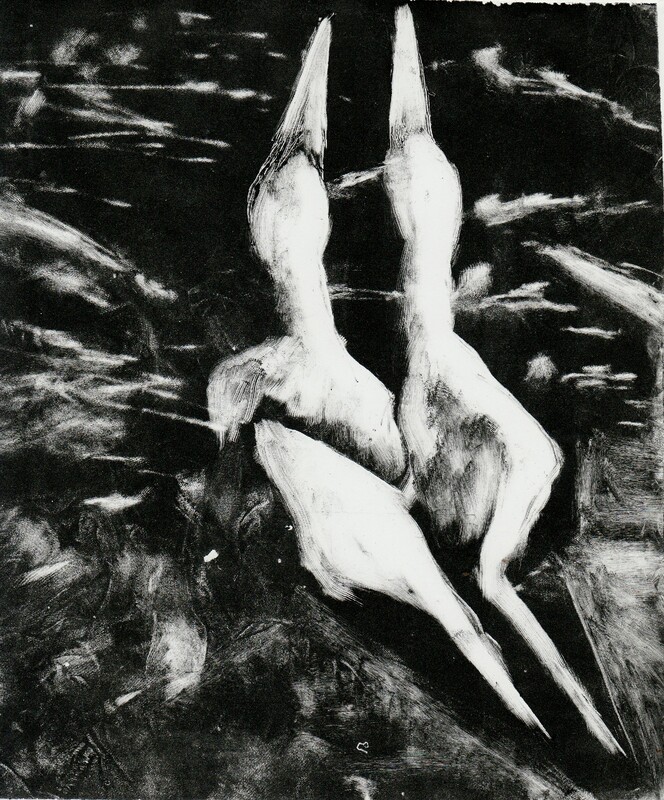 More interesting was a drypoint print posted by Nancy Farmer a few days ago. What interests me is to think about how to create original works in this method not trace my old stuff. 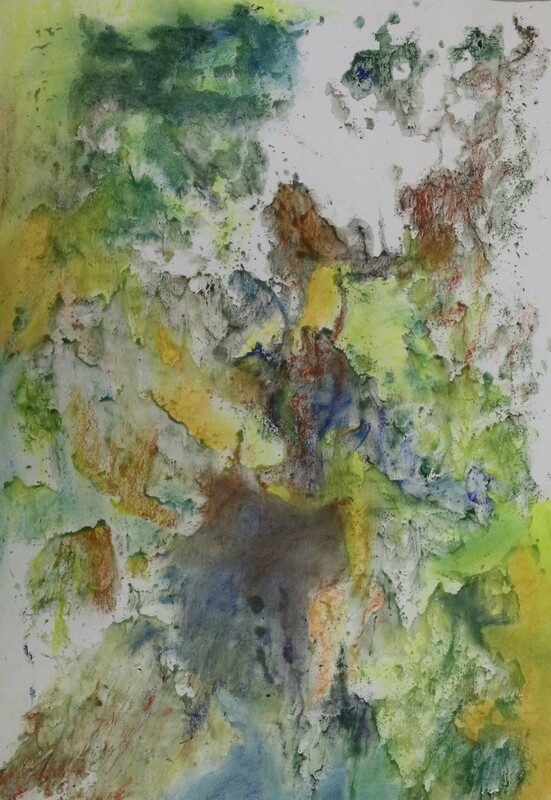 I have stood in the sleet, drawing using fallen snow and watercolour pencils on disintegrating paper. Actual rain stops play. 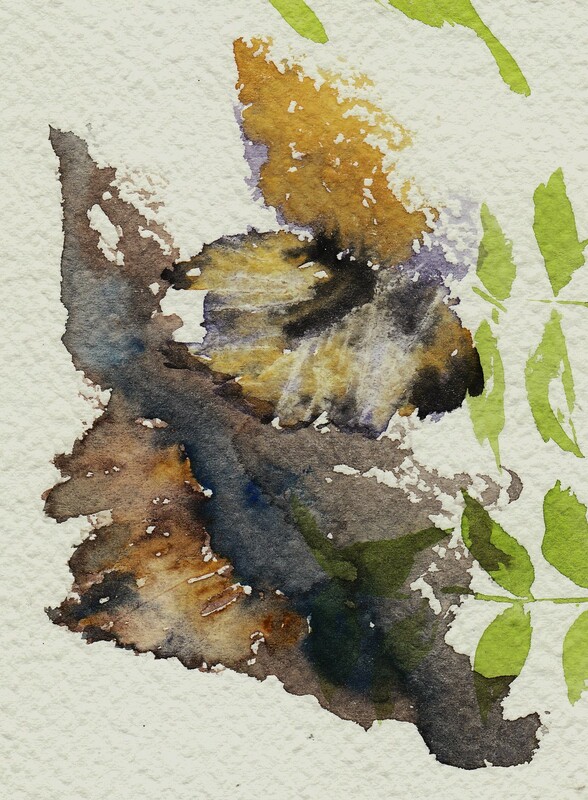 I wonder whether I can sketch with a nail onto a hard surface in all weathers. What would the resulting print look like? Do other people do this? Fast and clumsy would describe this. I couldn’t at first find a fine gouge to take out clean lines to show the beaks. The cuts on the tail on the right would have worked better the other way round. Amazingly, the stark contrast of black and white still drives a striking image for all its defects, showing the power of this technique. Practice and more time and care will help this. 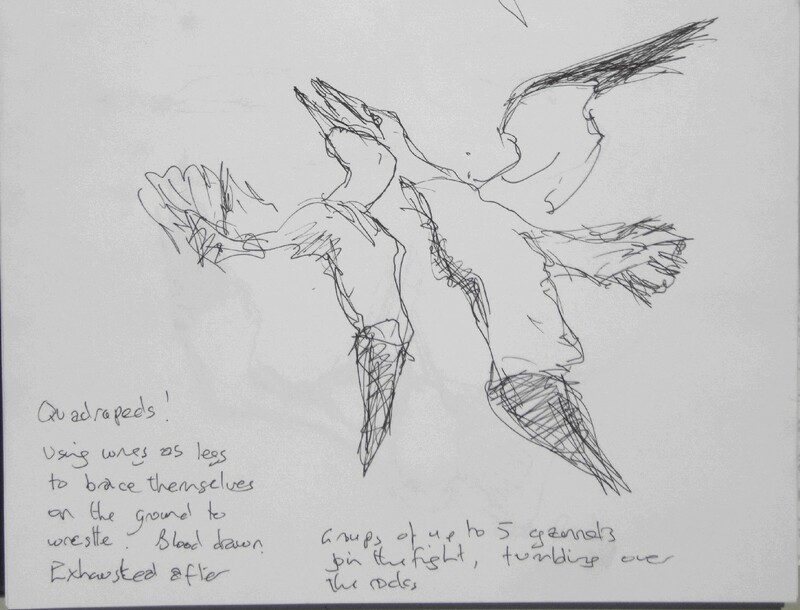 Below are the field sketches of the warring gannets used as the reference. 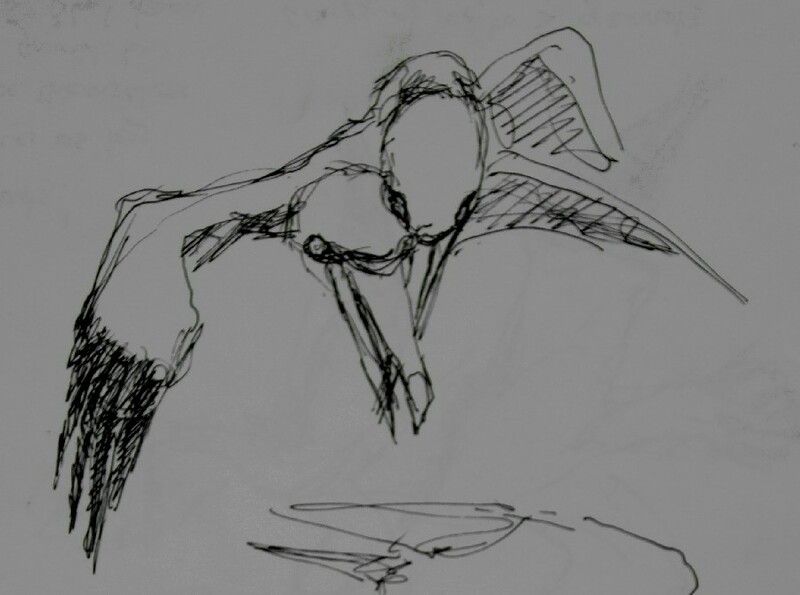 I begin to see how I might collect the information on contrasts and shapes in the field sketches with the future prints already in mind. I had another shot at this, trying to abstract from the sketch, putting in a first layer of colour and cutting more finely. 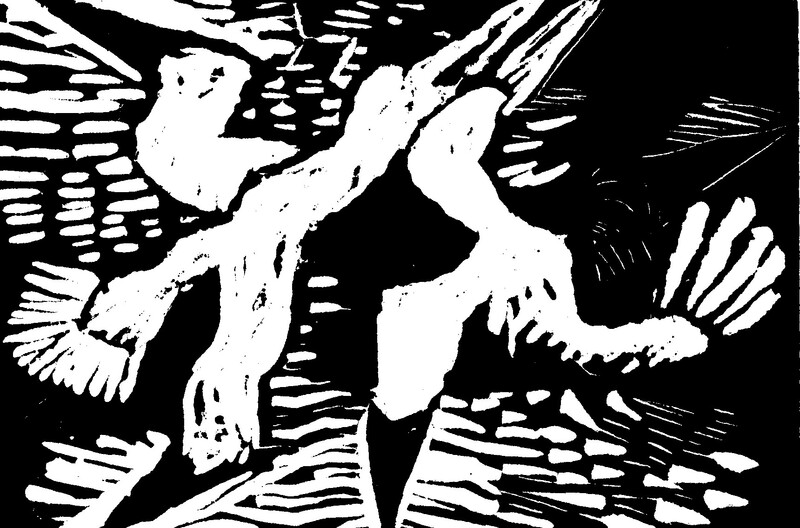 Even so, ink filled my gouges and obscured the beak on the left (there was not time to clean this out and make a further print). 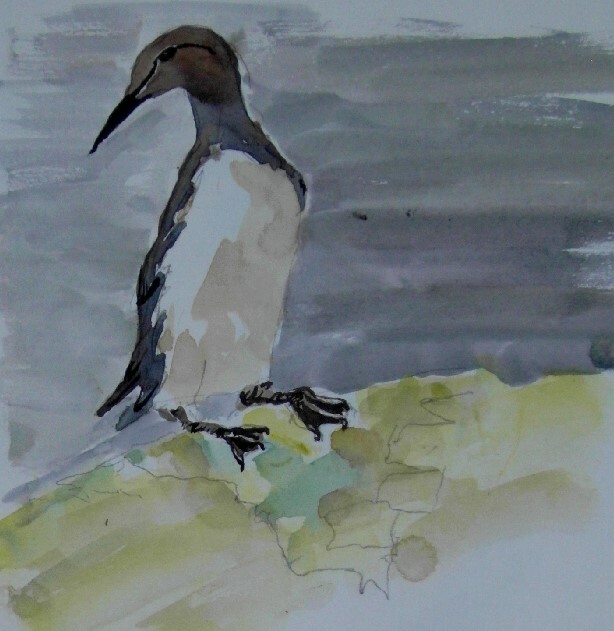 In June, I returned from the Seabird Painting Course with a set of ideas that I wanted to develop. Several artists were making sketches for a purpose, to develop secondary pieces of work in other media such as sculpture or printing. This intent affected how they drew, how they saw and thought. If you click on this link to Kittie Jones you will see a piece drawn on Bass Rock this summer. 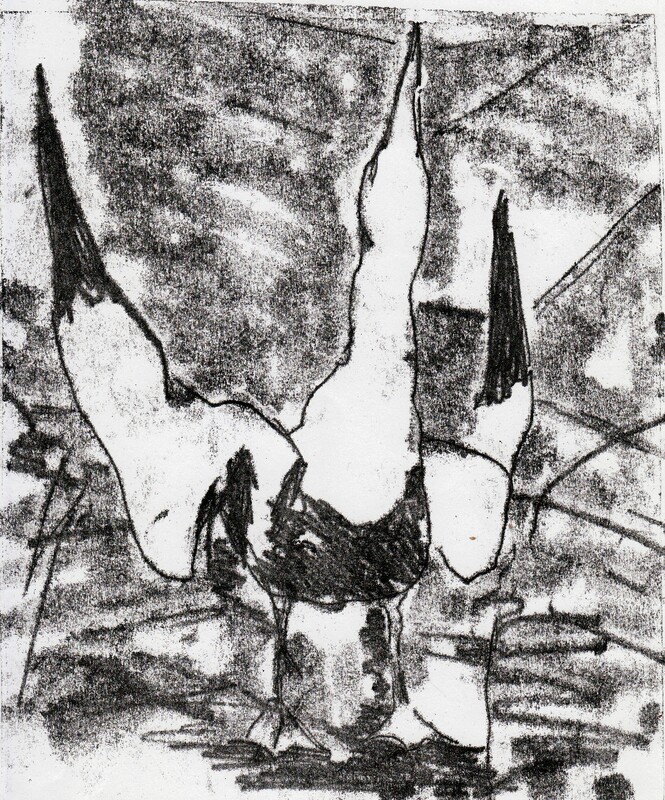 As well as drawing conventionally, Kittie did monotypes there on the rock amidst the guano. I love that piece. She describes her thinking here. I was inspired by this to start learning some printmaking skills. My aim is not so much to produce finished printed pieces, but to draw in the field as if making diagrams for a later abstraction. 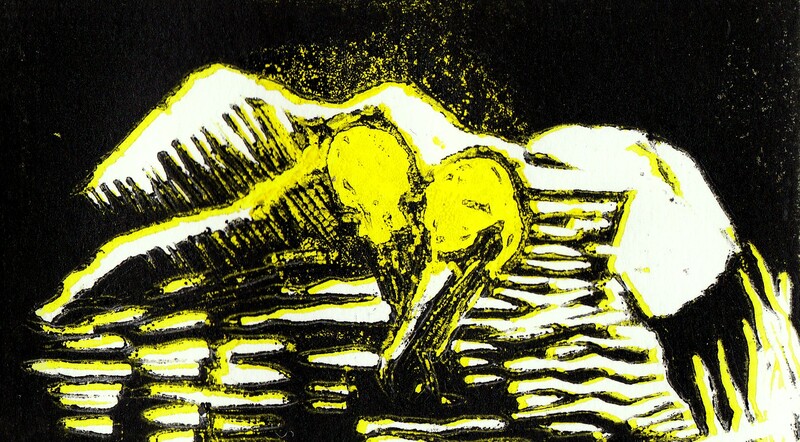 I found that we have, in Birmingham, a small cooperative printmaking studio and last Saturday joined an introductory workshop. With expertise and patience, Kerry led us rapidly through three techniques. 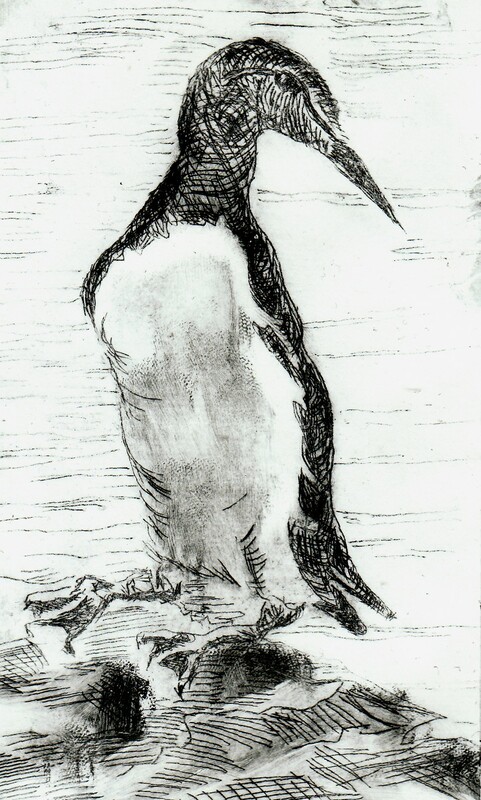 These are my first attempts at monotypes, working from fast line drawings of gannets on Bass Rock. The middle one, of course, is over-inked, but I still am interested by these textures. 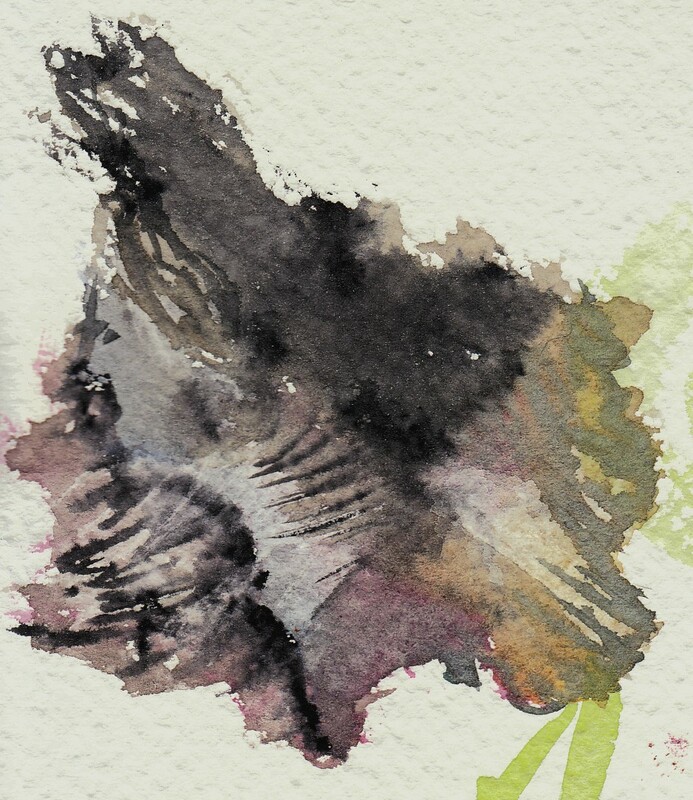 The lower piece was one clumsily done, lifting ink like finger painting in reverse. With more care and a better selection of tools, I can see how this technique can result in great images.